One of my favorite places to shop online is Amazon! I save my Amazon gift codes that I redeem through my online earning sites all year long and then use them to pay for Christmas gifts. It's a fun and frugal way to pay for the holidays without breaking the bank! Being Frugal and Making it Work has teamed up with 23 wonderful bloggers to bring you this fantastic Amazon Gift Card Giveaway! One lucky person is going to win a $50 Amazon Gift Card to spend on anything they choose! How cool is that? 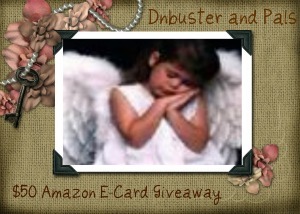 THE "DNBUSTER AND PALS" HAVE COME TOGETHER TO BRING YOU THIS GIVEAWAY WITH AN AWESOME PRIZE FOR ONE LUCKY PERSON! **Disclosure: This Amazon giveaway is being sponsored by the 23 twitter (bloggers) members listed above. All bloggers on the form paid an entry fee to be included in this giveaway. The fee each blogger paid was pooled together and used to purchase the $50 prize for the winner. Be sure to come back daily to complete the daily entries to increase your chances of winning! I Love Amazon giveaways. thanks! Thanks for stopping by and GOOD LUCK to everyone who enters! I entered to win! Thanks!